The AT4053a is a hypercardioid condenser microphone, designed as part of a 3-mic series of “pencil” mics with detachable capsules. The common AT4900a-48 preamp body with AT4053a-EL capsule makes an AT4053a. 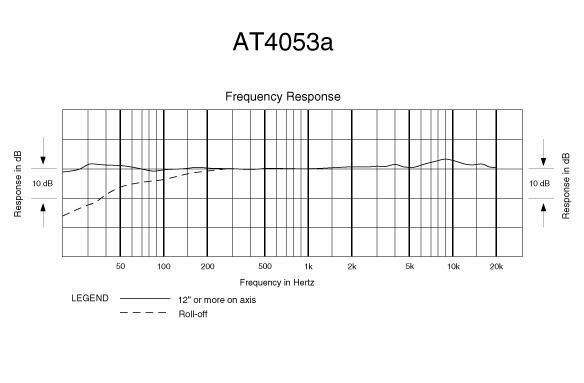 With the AT4049a-EL omni capsule, the resulting mic is an AT4049a; with the AT4051a-EL cardioid capsule, the mic is an AT4051a. The preamp body contains a switchable high-pass filter (-12dB/octave @ 80Hz). The output is balanced and transformerless. The mic ships with a clip (Audio-Technica p/n AT8405a), a foam windscreen (p/n AT8159), and a carrying case (p/n S1). It was replaced in Audio-Technica’s product line in 2008, by the AT4053b. See the link to the AT4053b profile in the sidebar.